A Dhaka court has sent actress Nawshaba Ahmed to jail rejecting her bail petition in a case filed under ICT Act. Metropolitan Magistrate Mahmuda Akhtar passed the order on Monday following the bail petition filed by Nawshaba’s lawyer Imrul Qaysar. 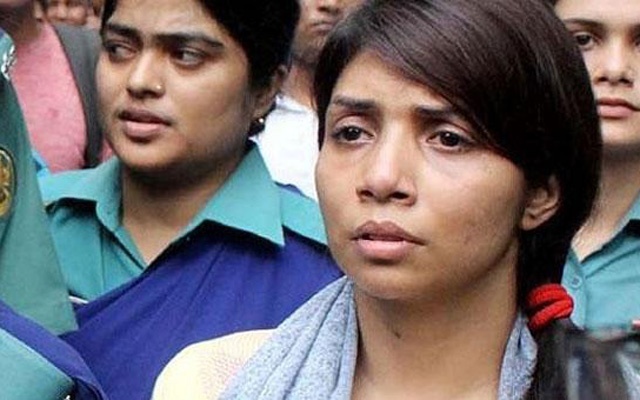 Earlier investigation officer (IO) of the case Rafiqul Islam brought Nawshaba to court from Dhaka Medical College Hospital (DMCH) where she had been undergoing treatment for past few days. Earlier on August 13, Nawshaba was admitted to DMCH under police custody due to illness. On August 4, Rapid Action Battalion (RAB) arrested actress Quazi Nawshaba Ahmed from city’s Uttara area for spreading rumours on Facebook over the attack on protesting students at Jhigatola. Her comments are believed to have played a role in the violent clash at Jhigatola on Saturday noon when 20-25 students were injured by alleged Awami League activists.